I’m trying something new. This will constitute my journal for our Adirondacks vacation of 2012. However, since we don’t have either Internet or cell connection on the camp, these posts will not be real time. I’ll lot them up when I return to civilization, but they will be chronological. To refresh, we stay at the Baekeland Camp in the geographic center of the Adirondacks, about halfway between Blue Mountain Lake and Raquette Lake. Our lake is Utowana Lake, which means “Big Waves,” presumably in the Iroquois language. It is a three mile long lake in what is called the Eckford Chain. Baekeland is the only camp on Utowana. There is no road to the camp. You have to come across the lake by boat. There is no TV and spotty cell service. It is the perfect place to unplug. We essentially own the lake when we are here. It is idyllic. 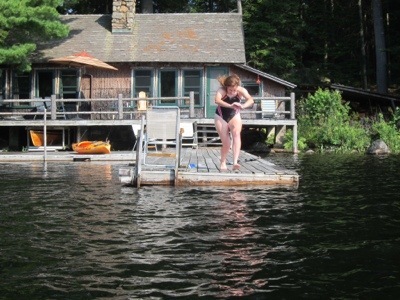 Here is Bridget diving off the dock of our cabin, situated on a small cove on the north side of the lake.